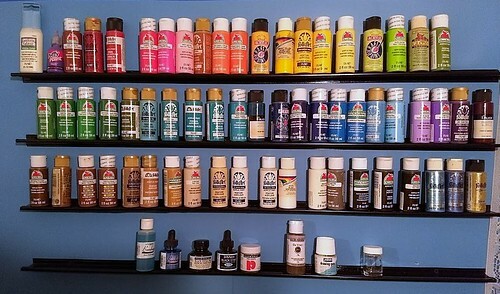 I had been wanting to put up thin shelves for craft paint, inks and other supplies in small bottles where I could see all of my colors at once. Found this idea on pinterest to use ceiling t-grid. I painted mine black. Glad that I did because they are next to a window with lace curtains. I put electrical tape on the edges to protect the curtains and it is the exact same color as my paint. They were exactly what I wanted. Does not take up floor or table space. Pinterest win! You can click the photo to see a larger image. This is the pin to the instructions on the original creators blog post.